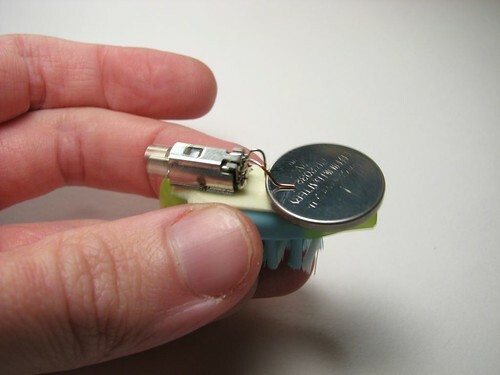 The BristleBot is a simple and tiny robot with an agenda. The ingredients? One toothbrush, a battery, and a pager motor. The result? Serious fun. 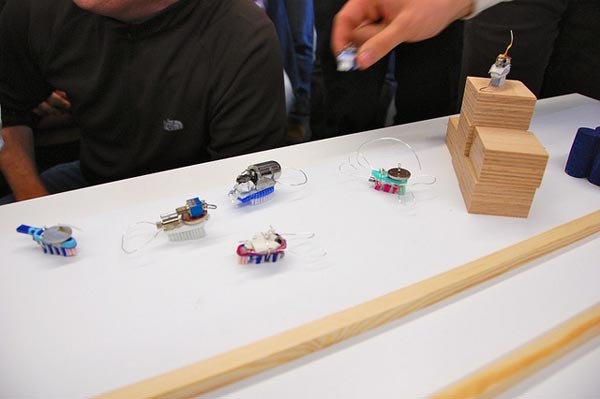 The BristleBot is our take on the popular vibrobot, a simple category of robot that is controlled by a single vibrating (eccentric) motor. Some neat varieties include themint-tin version as seen in Make Magazine , and the kid's art bot: a vibrobot with pens for feet. The starting point is of course the toothbrush. 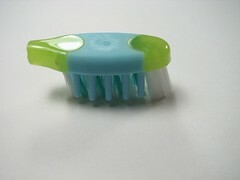 We need one that has more-or-less uniformly angled bristles. 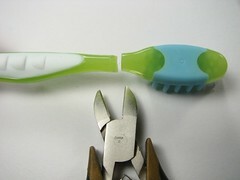 , it may take scissors to make the bristles all the same. 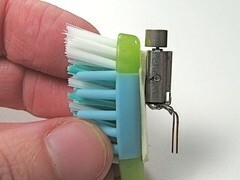 Cut off the handle of the toothbrush, leaving only a neat little robotics platform. Next, we need a vibrating pager motor or other tiny motor with an unbalanced output shaft. 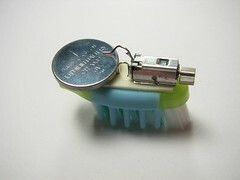 If you should happen to find a small enough motor you can always add the weight yourself, but usually motors this size are made for pagers anyway. I got mine on eBay for a few bucks, for example. 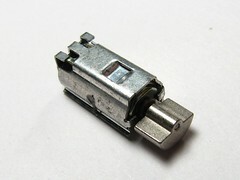 The kind that I got are happy to run on almost any common voltage-- probably a range of 1-9 V. As a power source, you can use an alkaline or lithium coin cell or watch battery, either 1.5 V or 3 V. To hook the motor to the battery I soldered short copper wire leads to the motor terminals. The last substantial ingredient is some foam tape. 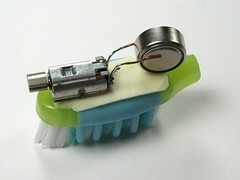 Apply a small piece to the top of the toothbrush robotic platform, which will be used to hold the motor in place. 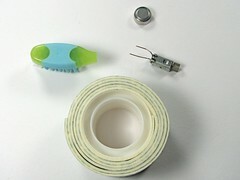 Attach the motor to the foam tape. 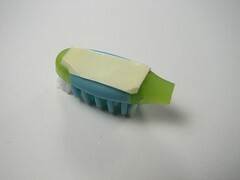 The tape provides a spacer so that the rotating weight does not hit the toothbrush head. It also provides a strong, flexible connection to the base that is able to handle the severe vibration that this robot experiences. A first approach to hooking up the battery might be to stand it on end. However, the battery itself is not held in place very well this way and will fall out shortly. A better method is to bend one of the leads down flush with the foam tape, so that you can *stick* the battery to the foam tape as well and still make an electrical connection. 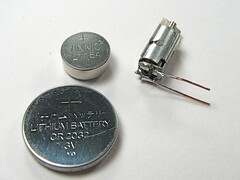 The other lead contacts the other side of the battery, and the motor can run. 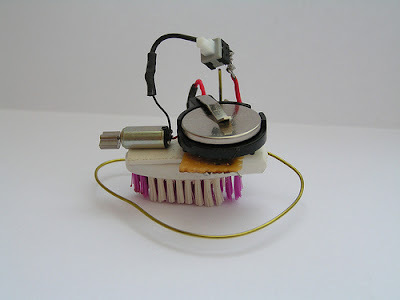 The completed BristleBot, running and ready for action. When you set one down, you may notice that it tends to steer left or right. We have found that battery and motorplacement, bristle shape (one stray long bristle can interfere with the motion, andmotor rotation direction all influence the behavior- so be sure to try flipping the battery upside down if you have trouble getting yours to go straight. Now and for the record, this is one of many different kinds of vibrobots-- there are a lot of other designs out there if you go and look. 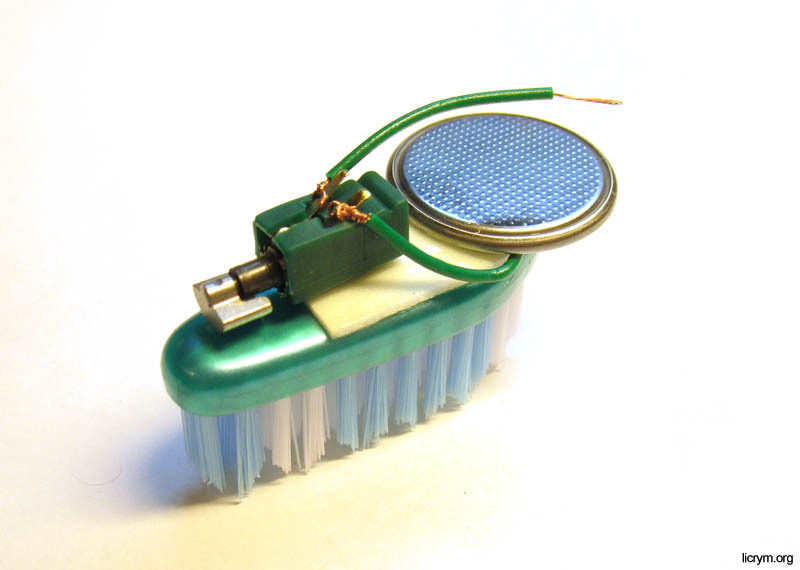 We have heard of and seen many other vibrating robots, and we know that even using a brush with angled bristles for propulsion has been done before. However, this particular miniature implementation may be unique, and is certainly fun. Very few robots that you can build so easily are so rewarding. With the right parts, you can make one in a few minutes. It might be great fun to make a bunch of them to race them competitively. The BristleBot is our take on the popular vibrobot, a simple category of robot that is controlled by a single vibrating (eccentric) motor. Some neat varieties include themint-tin version as seen in Make Magazine (check the video), and the kid's art bot: a vibrobot with pens for feet. 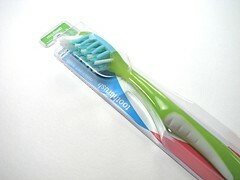 The starting point is of course the toothbrush. 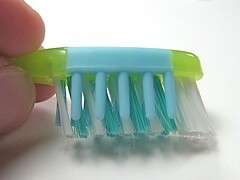 We need one that has more-or-less uniformly angled bristles. 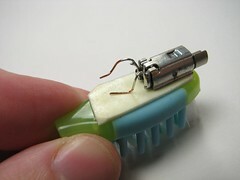 (While it may be possible to take one with straight bristles and bend them to suit, I haven't tried.) If the bristle length is nonuniform (as it is here), it may take scissors to make the bristles all the same. Next, we need a vibrating pager motor or other tiny motor with an unbalanced output shaft. If you should happen to find a small enough motor you can always add the weight yourself, but usually motors this size are made for pagers anyway. You can can add additional stuff to the above bot to make your own design like swith to power on . 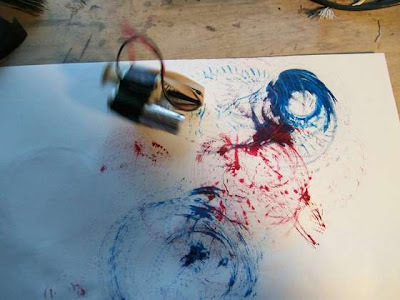 You can also enjoy its painting by dipping the brush in paint. Conference Bag out of tags?? ?